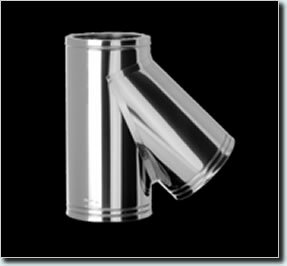 Twin Wall Flue Pipe 135 Degree Tee is normally required for external use, connects appliance at a 135 degree angle going through wall, tee cap required at bottom for cleaning. locking bands included. Available for 5” & 6” Flue Pipe.